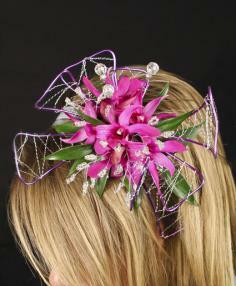 PURPLE TULIP FLORIST INC. can create the perfect hairpiece or hand held bouquet to enhance your prom night experience. Using flowers, we can match your prom style and colors. 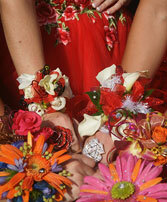 So remember, if you're looking for prom accessories in Milton, PURPLE TULIP FLORIST INC. is the place to be! 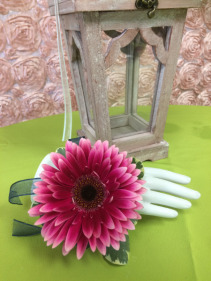 Go bold with this stunning Gerbera corsage. On a keepsake bracelet with custom picked ribbon to match your dress. 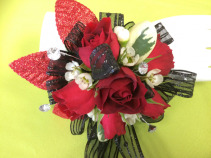 Basic sweetheart roses with accent flower and custom ribbon color and sparkly leaves and bling. Our basic corsages come in one of three colors red, white or pink call us today to pick yours. 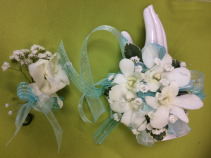 This is our basic Orchid Corsage and boutonniere set with custom ribbon colors and accent flower. 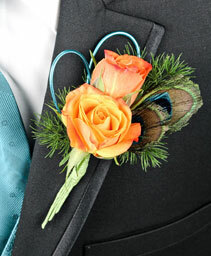 Call the shop today to order your custom ribbon color. 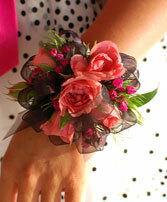 This beautiful pink rose prom corsage is accented with sheer black ribbon and tiny pink flowers. 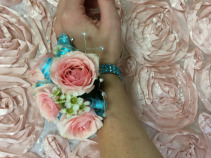 Call our shop to customize your corsage to match your dress, using white, red or pink roses.